Since one of the two most active volcanoes in Africa, Nyamarugira and Nyiragongo, erupted heavily on November 6, the regional tourism office tries to attract adventure tourists for an exclusive volcano trek. The “Volcanic Eruption Trek” is probably one of the most spectacular treks an adventurous tourist can currently go for in Africa. 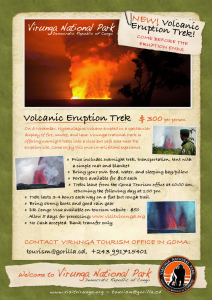 The Virunga National Park Tourist Office even arranged special Visa for tourists who want to experience one of the most active volcanoes worldwide. Normally getting a Visa for entering the DRC is quite tough but now for that special case an exception was made. For almost 1 ½ days adventurous tourists can book a trek starting in the provincial capital Goma near the Rwandan border. The National Park authority asks 300 US$ to experience this breath-taking spectacle of nature.